As a family business, the Vitamix story can be traced back to 1921. Vita means life and Vitamix’s vision is to improve the vitality of people’s lives and to liberate the world from conventional food and beverage preparation boundaries. They believe in creating relationships for life by developing and producing the world’s best performing and most reliable blending equipment.The company is steadfast in creating a better future through family values and healthy, delicious food. 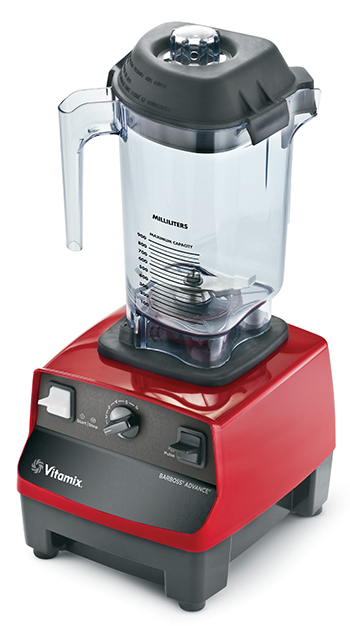 Vitamix persevere to create the highest-quality product through customer input and advanced technology. Building the industry’s most reliable blender begins with a careful selection of the world’s most durable materials. Each premium component of the Vitamix machine is an essential, strategically selected piece that extends the life and reliable performance of the entire machine. Vitamix takes pride in product excellence and we are confident that you’ll see the difference. The Vitamix Drink Machine Two-Speed is an essential tool for adding or expanding a beverage menu. Intuitive High/Low controls offer ease of use, and a Tamper is included for blending exceptionally thick frozen mixtures in the 64-ounce container. It keeps things simple with just two switches, while its powerful motor grinds through everything from whole fruit to cubed ice. This is the essential tool for every round. The BarBoss handles everything from frozen drinks to puréed cocktail bases. With six optimized program settings and automatic shut-off, the BarBoss Advance delivers consistent, delicious drinks while operators take the next request. BarBoss takes the guesswork out of beverage blending. Just select the blend time and press start to create the same delicious results every time. Get creative! The sky is the limit with the World's best beverage blender. The Touch & Go 2 offers reduced sound and consistent blends, quickly delivering smoothies, frappés, and frozen cocktails in a variety of sizes. With 34 optimized programs, you control the consistency of every blend. The Quiet One – Award winner at 2011 Kitchen Innovations for its ground-breaking hush! When the world’s largest coffee chain needed a blender that would consistently produce the same quality blends across 17,000 locations without disrupting the atmosphere, Vitamix softly responded with The Quiet One. The Quiet One is our quietest machine, offering noise-reduction technology, six optimized programs, and an Advance container for large batch sizes. It is also won an award at the 2011 Kitchen Innovations for its ground-breaking hush.